Aside from the crisp weather and turning leaves, the scents of fall is what people are probably most fond of. Sure, every season has it’s signature scent; The smell of fresh cut grass and rain always reminds me of gardening in the spring, the smell of coconut-scented sun-tan lotion will always remind me of vacationing in the summer and the fresh smell of pine and even the scent of scotch tape always reminds me of Christmas time. Yes… I said scotch tape! It has a scent! You’ll have to take a whiff of it next time you’re wrapping gifts. The scents that fill my head with memories of fall are many but out of all of them my favorite fall scent has GOT TO BE a lit candle inside a jack-o-lantern. Ugh that smells amazing to me! Brings back so many memories of Halloween as a kid. But, unfortunately I’ve never come across a jack-o-lantern scented candle so it’s not on my favorite fall candles list. 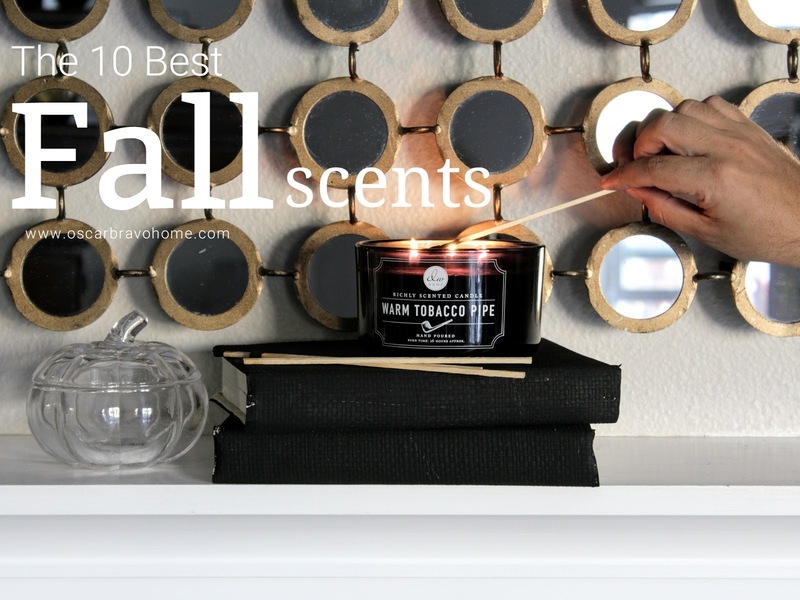 Also not on the list are super-sweet scented candles like “pumpkin pie” or any scent of baked goods. I mean, they smell delicious, but the scent is a bit overwhelming to me. What is on my list are my favorite fall scents that are a bit warm and earthy with notes of apple and pear and maaaaybe a hint of pumpkin. I have included affiliate links to all the candles mentioned, just in case you're interested in one. I can't believe we are talking AUTUMN! Time flies! In a couple weeks or so, I will be sharing my 2017 Fall home tour so if you're not already subscribed to my blog please do so, that way I can send you a short email letting you know when I post it. And for those of you that are already subscribed, I want to THANK YOU for keeping me company! It's smells bomb, you'll like it and yes just put it in a nice candle holder lol. OMG! Luv the scent to a warm sweet tobacco pipe! Didn't know a warm tobacco scented candle existed. Sounds a bit strange, but I'm buying one today. Thanks for the idea. You're going to LOVE IT!!! I haven't met anyone who didn't, it's that good 😉. Enjoy it! Hahaha! 😁 I thought I was the only one who thought of wrapping Christmas presents when I smell scotch tape. Too bad there isn't a candle. And you are right that Glade one is so good!